“A referendum, blaming the ‘other’, is an alibi for doing nothing” says Alistair Darling in a foreword to Professor Tom Gallagher’s little-noticed book. “My own preferred choice, like the majority of my fellow Scots at an earlier stage, would have been to support a more powerful Scottish Parliament via some form of enhanced devolution,” writes reluctant Yesser Professor Sir Tom Devine in his much-praised latest volume. This week Nicola Sturgeon, first minister, is readying to break with her post-2014 and, more recent post June 23 #EUref, caution and launch a much-delayed initiative to win over No voters to the cause of Scottish independence. Gallagher, a visceral No supporter, won’t be wooed. Devine has very recently warned the FM that she has at most five years, maybe seven at the outside, to make the case – and win #indyref2. Yet, one of the merits of the Devine tome is that it places the historic opportunity of independence within an historic context stretching from 1707 until now, from the (long-lasting) triumph of unionism until the threat of its break-up. This is done with broad brushstrokes but with plenty of detail nonetheless such as the startling fact that in two years from the first election victory of Margaret Thatcher Scotland lost a fifth of all jobs and, at 30.8%, a disproportionate amount of its manufacturing. Gallagher, by contrast, piles on the detail as if with a spray-gun, much of it disjointed as if one random thought simply led to another – many of them bilious. At almost 350 pages the book is far too long and suffers from being self-published – it could have done with some sharp and severe edits, and not just of several repetitive cadences, not least to heighten some of the most pertinent points he makes. Some of this informs Gallagher’s analysis which points to profound social changes as making society “more volatile and attuned to radical solutions for political issues” as lying behind the “sheer velocity of the SNP surge” – and that of other populist movements. There’s the rub: he does not make enough distinction among these various movements all over Europe, from the neo-fascist Orban’s Fidesz via the anarchic Five Stars to the new euro-communist Podemos. Rather, he highlights the SNP’s exploitation of grievance and its base in identity politics. Above all, he seems obsessed with Alex Salmond who once dismissed him as the “nutty professor” and the risk he and his party pose of “greater discord and fragmentation in the world.” (As if these did not exist already). Worst of all, they “trade on negation,” backed by a “cacophony of noisy indignation” among their supporters about England’s alleged role in holding Scotland back. Unfortunately, both these books were written in the second half of last year at the latest so cannot take account of the impact of that Brexit vote. Arguably, rather than promote the case for #indyref2 the majority to quit the EU, however small and questionable, helps undermine it. While nothing suggests that the May government in Westminster has a clue what Brexit means (despite her emphatuic tautology) the Sturgeon-led SG appears to be floundering even more. If the First Minister sees a second referendum as an escape route from her political quandary, then threatening to deploy this weapon may diminish her (coinsiderable) influence on May. And Devine’s remarks in his book about the continued rootedness of the Scots’ hybrid or dual identity appear borne out by subsequent post-June 23 polling. Those of us who feel rather Scots and European instead are, sadly, very minoritarian. in his foreword to Gallagher’s book, Darling talks of the author’s call for a “new conversation” in Scotland and a break with an apparent or would-be stranglehold of the SNP upon political discourse. His old mucker, Gordon Brown, has just set out his own highly pre-emptive version of Home Rule that supposedly goes beyond Smith and The Vow and sees a post-Brexit new constitutional and financial settlement. It at least sets the tone for what should indeed be an open-ended, non-partisan, robust discussion about Scotland’s future – in or out of the EU. These two books help inform it but it is now more urgent than ever. At least our friend Loki, commentators such as Gerry Hassan and others are up for an end to this tedious binary “debate” so let’s get on with it. These pages are certainly open for it. > Indeed, Devine’s view that the party has failed to “get to grips” with three key weakness of the Yes campaign has hardened: on currency, pensions and the economy. And that is indeed a serious failing, probably caused not so much by a lack of plausible answers on these questions as due to the plausible answers being possibly unpopular. I am also sceptical about Brexit being the topic that moves Scots to support independence: England outside the EU and Scotland in it opens up a further rich set of uncertainties. That said while the answer to the difficult questions might reveal tough choices – Scots will have to face uncertainty and be prepared to answer tough questions in order to become independent. Take for instance the economy: as the article notes “in two years from the first election victory of Margaret Thatcher Scotland lost a fifth of all jobs and, at 30.8%, a disproportionate amount of its manufacturing.” Maybe an independent Scottish government could do worse than that, but it seems unlikely. We know that Westminster regarded the Scottish fishing industry as ‘expendable’ in the CAP accession negotiations for the benefit of East Anglian wheat farmers. Hard to imagine the Irish or Danes regarding their dairy or bacon industries as ‘expendable’ for the benefit of people in another country. We know Ireland has a vibrant media industry driven by long term government policy. We also know that the BBC collects hundreds of millions in Scotland and spends most of it in London. And so also for pensions: existing or soon to be pensioners must be given certainty about what exactly independence means. But clearly if an independent Scottish economy is a long term poor performer then future pensions will be poor. ‘Tis so. But the Scottish economy inside the Union has long term (since c. 1920) performed poorly, and British state pensions are among the lowest in Western Europe. I’m glad of this review and I accept that the book could have been better edited. But in its defence I might point out that it offers a thematic approach with chapters on the Cause, the Party, its Leaders, their Opponents, the catalytic recent breakthroughs, the SNP and culture & the SNP in the World; it’s thoroughly referenced and glaring errors have so far not been pointed out to me (though I’ve spotted a few lesser ones). I’m also glad I self-published the book (first of 13 like this); I know that if I had gone through the conventional publishing route it would not be due to come out until sometime next year with little chance of factoring in 2016 developments. The book was read at proof stage by two senior journalists, one of whom has held editorial positions in the Scottish media. I don’t think Brexit torpedoes any part of the analysis. 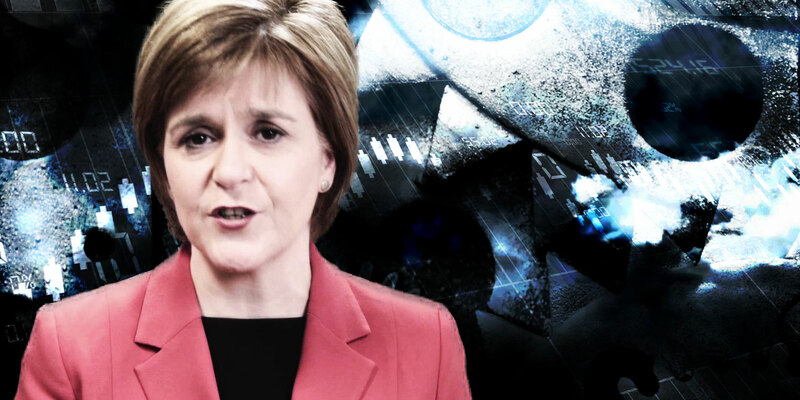 The EU has always been a propaganda prop for the SNP – nothing more – and the First Minister has shown that by engaging in a ceaseless round of stunts at home and away while the governance of Scotland languishes. David Gow complains about ‘bilious’ remarks without pointing out what they are and at whom they were directed. I actually avoided dwelling on the personal foibles of SNP politicians which if this was a standard ‘knocking job’ I might have been expected to dredge up and, if I say so myself, Nicola Sturgeon emerges well from the book. . The complaint that too much attention is devoted to Alex Salmond is a curious one when his approach to amassing power, campaigning, and trying to delegitimise the British state helps to explain the rise of the SNP to a great extent. The SNP’s strategy is to treat him as a venerable figure from the past who is not integral to the ‘modern’ SNP is one that has been swallowed by much of the wider media. The individuals whom I do criticise robustly are those in the wider civil society and literary scene who made it all too easy for Salmond to coarsen the political culture of Scotland. I refer to Val McDermid and Neal Ascherson but especially to Prof Tom Devine and Kevin McKenna. I belong to the same catholic Irish-derived sub-culture as the last pair and I know that scarcity of professional openings and naked ambition have made some of the more precocious talents from our community behave politically in ways that might, on mature reflection, seem reckless and unseemly. They were too keen to designate England as ‘the other’, they either overlooked the well-organized rough-house stuff that marked certainly the closing stages of the Referendum campaign or else dressed it up as effervescent and liberating (which McKenna still does two years on). If Sir Tom’s Indy hopes of 2014 had been realised, then the outlook for bright but impecunious Scots, hoping to get on via education, would have been much, much worse than it now is under an SNP government which treats education as an ideological plaything. A less reverential media culture would have explored the nature of the 2013-14 campaign which I make no apologies for doing and would not treat intellectuals like Devine as almost secular saints. One arguably useful thing the hapless David Cameron did by plunging ahead with a poorly-planned referendum on Scottish independence was to give the opportunity for the SNP to fully display some of the more ignominious traits in its DNA. I am sure Nicola Sturgeon would like to erase from the collective public memory some of the less edifying features of the referendum campaign as she makes overtures to ‘No’ voters but this will be hard to accomplish. I may be a pariah figure, my book barred from the Edinburgh Book Festival and the pages of the Scottish Review of Books but I am actually fairly comfortable in my own skin about being peripheral in such a tawdry official Scotland as this which tries to ensure that cultural ‘debate’ does not stray too far from what the ruling party desires. I have spent years of my life in Eastern Europe where similar power-plays have ended in tears for outfits which have the same mission of control and dominance as the SNP. Thankfully I don’t think what’s at stake for Scotland is as dramatic but I sense that the craven and un-heroic stance of the 4th Estate and the cultural world will prolong the staging of this mediocre political drama longer than ought to be the case.